Hummus. Pretty simply, right? Chickpeas and sesame paste. How could you F that up? Well. Let's see. You could start by buying it in a plastic container, from some Sabra or Shatila, or another go-getter, R&D'd, well-capitalized, "hummus will change the world" enterprise. But hummus won't change the world. It won't bring us together. In fact, it tears us apart. Hummus is mine, my people made it, and your people stole it. Lebanon tried to patent it or some such nonsense. So F all this "let's hold hands and dance around a bowl of hummus sh#t." You could also F it up by your choice of topping or, even worse, "flavor." Maybe you like pink-coloured roasted red pepper "hummus" or maybe you like to put cilantro and culantro and culo and pesto and ernesto guevara and apricot jam and chicken liver marmalade on your hummus. You might as well stick your foot in it and call it Lake Michigan, cause it's not hummus. The range of acceptable garnishes is very narrow. The range of acceptable base ingredients, an immutable kernel. Finally, you might F hummus up by calling it "KHHOOOOMOOOOOOOOS." Do not ever come up to Habibi and say "KHOOOMOOOOOOS." Habibi will slap you and yell TERRORIST! and call the FBI on you. It's simple. Really, it is. And here's how I make my hummus. A few disclaimers: (1) we are making this with canned chickpeas, hardly ideal, but we can discuss soaking and boiling dried chickpeas later (we might also discuss using a mortar and pestle); and (2) yes, some variations outside this formula may be acceptable, but you must first master the basic hummus before you play around with adding things like ground cumin, sauteed and spiced lamb, or ful. Here's my recipe. I think it's a damn F'ing good one. 1) Drain and wash the chickpeas. Peel each chickpea. You can do this by gently squeezing each one. The naked, unadorned chickpea will slide right out of it's shell. 2) Simmer the chickpeas in a small pot with enough water to cover them by about a half inch. Simmer them for about 15 to 20 minutes on a low flame. 3) After you have finished simmering the chickpeas, use a ladle or other device to remove about half of the liquid from the chickpeas. Put this reserved liquid to the side. Save a few whole chickpeas for garnish as well. Put the remaining chickpeas and liquid in a blender of food processor. The water should come up about halfway to three-quarters in the chickpeas. 4) Add the tahini, and juice of half a lemon, the roughly chopped garlic, and a good dose of salt (use your judgment). 5) Blend until VERY smooth. If the mixture seems to thick, add some of the reserved simmering liquid to loosen the hummus up and continue blending. The texture should be creamy. Taste the hummus now. Add more salt and/or lemon if you think the hummus needs it. 6) Once everything is swirling in the blender/processor very smoothly, drizzle in the olive oil (while the hummus is still mixing) to thoroughly emulsify it into the mixture. Drizzle in a tiny bit more tahini as well. 7) Plate the hummus in a shallow bowl so that the hummus is raised at the perimiter and in the center, with a sunken moat in the middle. We will use this moat to fill with olive oil and lemon juice. Garnish the hummus. Make it beautiful! First, add a few squirts of lemon juice and drizzles of olive oil to the "moat." Sprinkle on some paprika and sumac. I also use urfa biber or aleppo pepper. Throw on the whole chickpeas that you reserved. Other acceptable garnishes include chopped parsely, chopped or sliced chili peppers, and pine nuts. DO NOT ADD CELLAR AGED CARROTS OR WILD-FORAGED MUSHROOMS OR SOY-MISO COD. 9) Eat. At this point the hummus will still be warm. Eating warm hummus with good Middle-Eastern bread is one of life's great joys. 10) DON'T F IT UP. Last edited by Habibi on April 3rd, 2013, 10:11 am, edited 2 times in total. What's your opinion on garnishing with cumin? Pine nuts? Some of my favorite restaurants do this. Yours is the second recipe I've seen in recent months highlight the importance of peeling the chickpeas. It is a Herculean labor, but well worth it to avoid the grittiness typical of homemade hummus. Thanks, Habibi. That looks so good -- I almost licked my screen. I look forward to the discussion of canned vs. dry chick peas. I've been using dried since I'm a cheap bastage and they're 99¢/lb at Valli. No doubt your standards WRT what is acceptable Hummus are vastly different than mine. Habibi wrote: But hummus won't change the world. It won't bring us together. In fact, it tears us apart. Hummus is mine, my people made it, and your people stole it. Lebanon tried to patent it or some such nonsense. So F all this "let's hold hands and dance around a bowl of hummus sh#t." P.S. Thanks Habibi for the recipe. I'll be making it this weekend. It will be the first time I've de-skinned the garbanzos and I can't wait to taste the difference. DAMN but that looks good Habibi! YESSS! Luckily I have TWO superb Lebanese restos in Montréal to do the work for me! I know I've seen the ZIYAD brand all over, but the AL KANATER I'm not so familiar with. Where could I find some? JoelF wrote: What's your opinion on garnishing with cumin? Pine nuts? Some of my favorite restaurants do this. I've never used cumin. I've never seen it, but Turkob (I believe) mentioned that it was common in Syria. Doesn't sound terrible to me, but I associate that flavor more with ful. I'll try it sometime. Pinenuts are a great, fragrant, luxury garnish. Use, toasted first, if possible. HankB wrote: No doubt your standards WRT what is acceptable Hummus are vastly different than mine. Not my standard. THE standard. fropones wrote: I know I've seen the ZIYAD brand all over, but the AL KANATER I'm not so familiar with. Where could I find some? You can usually find Al Kanater at any Middle Eastern grocery, or even any place that carries Ziyad. They seem to go hand-in-hand. It's a Lebanese brand, but really, any good tahini will do. HankB wrote: I look forward to the discussion of canned vs. dry chick peas. I've been using dried since I'm a cheap bastage and they're 99¢/lb at Valli. I've been using dried chickpeas ever since I got a pressure cooker. You can go from dried to fully cooked in 25 minutes. Some people soak bean before putting them in a pressure cooked; I don't. I also don't bother peeling the beans (out of laziness). True Dat. I think it was actually shot in California. I'm such a rube I didn't even know peeling chickpeas was a thing. Definitely looks like a must try recipe. I have read peeling them makes the hummus very smooth. Yes I will try your recipe. I do not like anything really but garlic in my hummus...no cumin I am not fond of that spice too much. I do not mind a few pine nuts but will not be putting them in. (I do have a weakness for red pepper hummus). I will say hum mus so you will not consider me a terrorist. I've been experimenting quite a bit since eating a weekful of bowls in Jerusalem and Bethlehem environs earlier this year, and the factors that seemed to make the most difference vs. what I've had or made here are shelling the chickpeas, simmering the chickpeas, and really upping the lemon and tahini, all represented well here by Habibi. There is an alchemy to just these basic ingredients that adding other stuff, including strong spices and roasted vegetables other than other pulses, seems to destroy. I get a slightly different flavor - grassy, smoky - from commonly available dried chickpeas here, but it is subtle, and the textural difference is virtually undetectable, so I'm happy with canned. Not necessarily for ingredients or addition order, but for processing method, this video from Abu Shukri (which had some distinctively wonderful hummus) is evocative for me. (Ignore the sound, but do watch for a "we have no branches" appearance as recently cited). Just a note: Years ago before supermarket brands were common, I -- one time -- bought canned hummus. By itself it was absurdly bland. So I added some lemon. At which point I realized that any dollars, time and effort I'd saved by buying a can of hummus versus a can of chickpeas was pretty much wasted. Thanks for continuing to spread the gospel of what is (AND IS NOT!) hummus, Habibi. 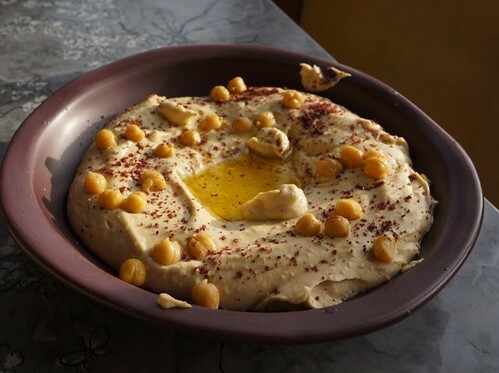 I had my first taste of hummus 30 years ago this August when my family moved to Saudi Arabia. It didn't take long to fall in love with it, particularly when served by fresh bread just a couple hours removed from a local baker's oven. Thanks, Habibi. I've got all the ingredients on hand; nice to know what to do with them. I don't know if anyone has mentioned this, but boiling the Chick Peas for a couple of minutes. then immersing them in cold water, makes them easy to pop them right out of their skins. Still a PITA. I too am a little put off by "flavored" hummus, but I have to admit a that few I have tasted are pretty good, but certainly not worth the inflated prices. Last edited by d4v3 on April 3rd, 2013, 5:43 pm, edited 1 time in total. Santander wrote: I've been experimenting quite a bit since eating a weekful of bowls in Jerusalem and Bethlehem environs earlier this year, and the factors that seemed to make the most difference vs. what I've had or made here are shelling the chickpeas, simmering the chickpeas, and really upping the lemon and tahini, all represented well here by Habibi. There is an alchemy to just these basic ingredients that adding other stuff, including strong spices and roasted vegetables other than other pulses, seems to destroy. I was going to note, when I wrote this post, that Santander would really be the one to consult about how it's currently being done back in it's home. A few notable things about the Abu Shukri video (aside from the aweful music) - did you see how well-stewed those beans were, how they literally melted away as soon as the mortar was applied? That's what we are aiming for, canned or not. I suspect that those beans, which started dry, took at least a day or two of soaking, and many, many hours of slow cooking before they reached that stage. Even with the can, the longer the simmer, the better. And the copious amounts of lemon juice, tahina, etc. Thank you so much for the comprehensive hummus recipe. After seeing that gorgeous photo, I had to try it. Stopped in Albany Park for some fresh pita and some sumac. Followed directions and didn't F up (but came close...). Delicious-- completely worth the extra effort of peeling the chickpeas-- husband and daughter raved about how much better it was than usual. We ate it all, one pita scoop at a time. Now... any suggestions for what to do with all that sumac? The smallest bag I could find was 12 ounces. Pie-love wrote: Now... any suggestions for what to do with all that sumac? The smallest bag I could find was 12 ounces. Pick up some lahmacuns from GNR-winner Cafe Orchid (or take a crack at it, they're not difficult to make if you have a pizza stone). Reheat them in the oven then top them with lettuce, onions, and a good amount of sumac. Roll it up and enjoy. You'll go through sumac quickly this way. I know I do. Last edited by turkob on April 3rd, 2013, 8:29 pm, edited 1 time in total. Another idea would be to fry up the left over pitas and make fattoush. turkob wrote: Another idea would be to fry up the left over pitas and make fattoush. Thank you! I will keep this in pocket for tomato season! Totally off-topic, but: in Montréal, at the Marché Jean-Talon, there's a veg+fruit shoppe that sells green chickpeas. They are the *tastiest* little buggers, on a level with edamame. Fun to buy 500g and spend the afternoon peeling and chewing. Excellent post Habibi. Like Darren72, I always start with dried chickpeas. While I think the canned are fine in a pinch, I prefer the dried and I think it gives you a little more control over the sodium. I soak the dried chickpeas overnight in water with a little baking soda to soften them. I'll admit that I have not always removed the skins, and I've noticed it does make a difference - but I hate peeling the f'ers! I always use a little cumin, but I mean a little . . . very little. Too much cumin and the hummus is destroyed (but that's generally true with garlic and tahini too I suppose - all about balance). Habibi wrote: 1) Drain and wash the chickpeas. Peel each chickpea. You can do this by gently squeezing each one. The naked, unadorned chickpea will slide right out of it's shell. Was talking hummus with Nasser at Dawali a few years ago and he showed me his deskinning method. When dried chickpeas are just about done agitate, by which I mean stir, not piss-off, the simmering pot, skins float to top of pot remove with spider/strainer. Dawali's hummus is quite smooth, though I have not been in a while. Guess I fall in the terrorist category as my 'fancy' hummus has both jalapeno and a blend of toasted Mexican spices. Nice post, your hummus looks terrific. Never thought of simmering canned chickpeas, will try soon. Not that you need it from me, Gary, but I'll gladly cosign that hummus. The judicious use of add-ins, the light, artistic touch with the garnish, and the light texture all tell me that yours is safely within the bounds of acceptable hummus. Now, whether or not you are a terrorist, that's another story...I've heard that you can be pretty fanatical about certain righteous causes - i.e. BBQ. G Wiv wrote: Nice post, your hummus looks terrific. Never thought of simmering canned chickpeas, will try soon. I never thought of it either. Last time I made hummus, I did pop the skins off and thought it made for a smoother and tastier version. My family proclaimed it the best I had made. I will try to top that performance with simmering the canned chickpeas first. Thanks for the tutorial, Habibi.